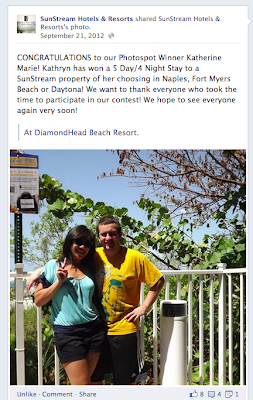 Last year I won a Facebook Photo Spot Contest held by Sunstream Resorts. My prize was a 4 night 5 day stay and any of their resorts. After doing some research and reading Tripadvisor I made the decision to go to Gullwing, mostly because of its reviews and I also wanted to try something new, not just go back to Diamondhead. 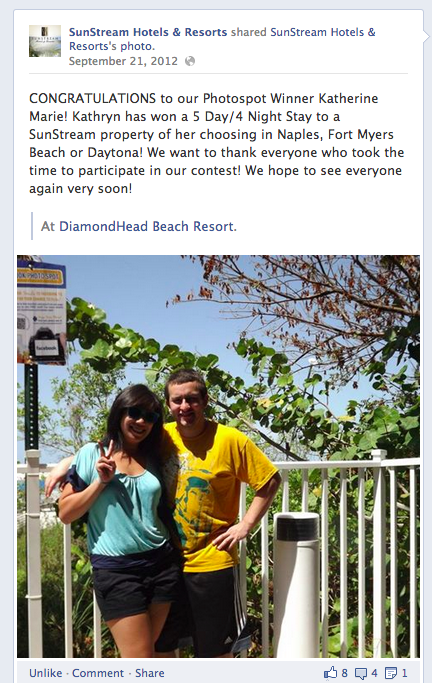 Last week during my Florida vacation I got to stay at the lovely Gullwing Resort a Sunstream Resort. I've stayed at Diamonhead in the past, so I knew that Sunstream Resorts were nice, but boy did Gullwing exceed my expectations. As you'll see from the video below our room was HUGE way more than the two of us needed. It was a two bedroom island view with two bathrooms, a full kitchen and in-unit washer and dryer. The best part was they gave you everything you would need to start off your stay: two single use coffee pods with cream and sugar, laundry detergent, soap for dishes and the dishwasher as well as the usual shampoo, conditioner, and lotion. Even though we had an island view we could still see both the ocean and the bay on either side of our balcony, it was a beautiful site. The beach in front of Gullwing is HUGE and as we were walking along there were little pools with tadpoles swimming around and seagulls chilling. They also had this little two person cabanas lined up in front of the water. One of my favorite parts was in our bedroom, the master, had an on-suite bathroom with a jacuzzi tub. I couldn't ask for more especially when it was rainy outside. I just hopped in the tub and enjoyed a mini jet massage. I would definitely recommend this to anyone that wanted to cook their own food or for families. If we had a kid(s) they would get their own room, and what kid doesn't love that on vacation. Five Stars on the Kat Scale!